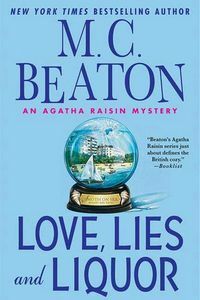 Love, Lies and Liquor by M. C. Beaton: Synopsis and Online Purchase Options. Synopsis (from the publisher): Agatha Raisin is lonely. Busy as she is with her detective agency and the meetings of the Carsely Ladies' Society, she still misses her ex-husband, James Lacey, so she welcomes his return to the cottage next door with her usual triumph of optimism over experience---especially when he invites her on holiday at a surprise location that was once very dear to him. With visions of a romantic hideaway in Italy or the Pacific dancing in her head, Agatha goes off happily with James to … Snoth-on-Sea, in Sussex. While James may have fond memories of boyhood holidays there, Snoth-on-Sea has seen better days, as has the once-grand Palace Hotel, now run-down and tacky and freezing cold. Nor do the other guests have much to recommend them, especially the brassy honeymoon couple, Mr. and Mrs. Jankers, who pick a fight with Agatha in the dining room. But trouble has a way of following Agatha even if romance does not: Just as she and James are preparing to flee to warmer climes, Geraldine Jankers is found dead on the beach---strangled with Agatha's scarf. So much for Agatha's holiday fantasies: Not only is it time to put her detective skills to work, but the police are not even sure that she'll be allowed to leave town.